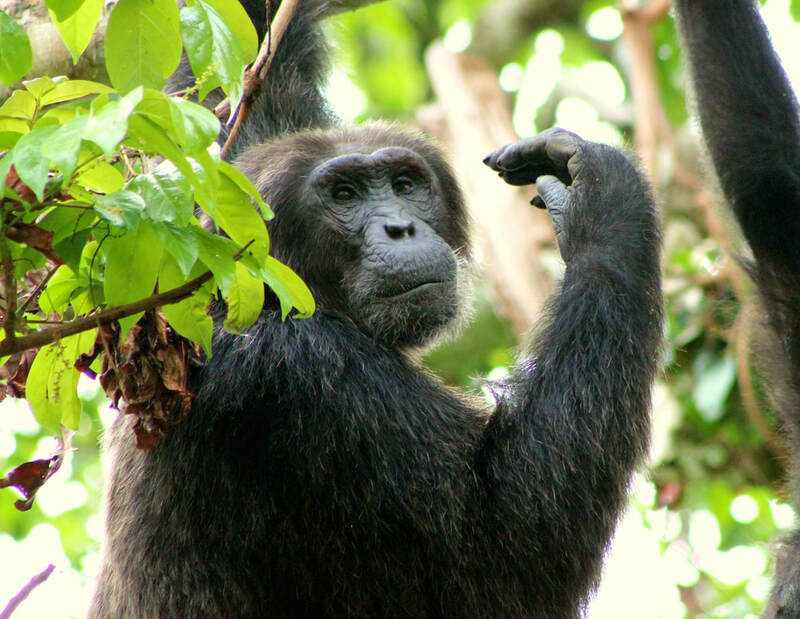 Meet the group's long-term alpha male: SYLVESTER. So-named for his distinctive silvery coat, Sylvester (often affectionately shortened to 'Silver') is a big chimp in his thirties. Much-respected by everyone, he runs a tight but harmonious ship; he only needs to bristle to restore order and rarely resorts to physical reprimands. A prolific groomer of males and females alike, he invests much of his time maintaining good relationships with others in his community. Aged 12, MOSES is on the cusp of adulthood. His physical transformation over the last year is striking: he's like one of those teenage boys who, when you see them after a break, you think 'wow, when did you get so big?!' Even alpha male Sylvester has taken note and sometimes grooms him. Moses has a complex character, at times calm and quiet, other times excitable and irritable. He's Bulindi's best stick thrower: if he's annoyed (or bored?) it's not a good idea to walk under his tree. But Moses has a soft side: he's an avid groomer and loves playing with infants. He took care of younger brother Araali when their mother Olive was killed crossing a road in 2015. We expect Moses to lead the group in a few years time. ​Araali is the epitomy of resilience and spirit in the face of misfortune. 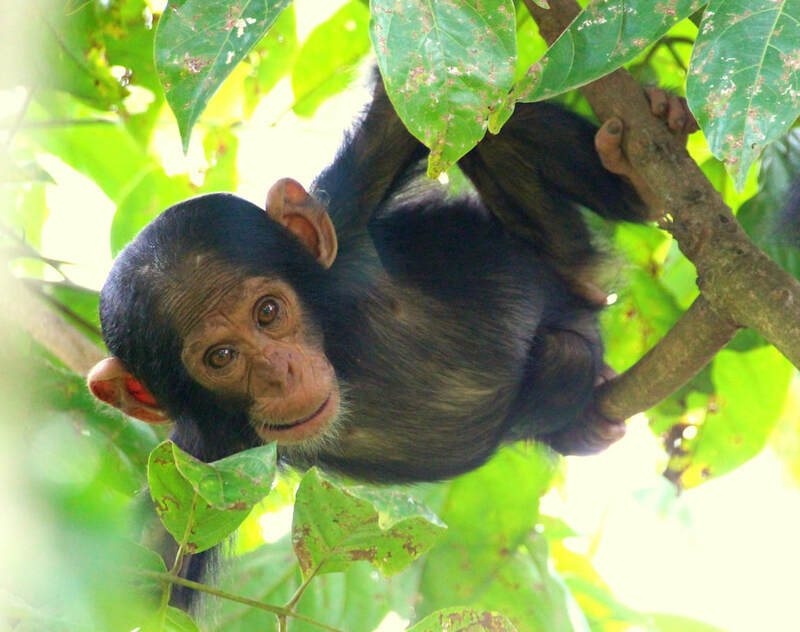 Orphaned at the age of 5, when mum Olive was killed by a speeding car, most young chimps would have struggled to cope with the loss. Thanks to support from older brother Moses, and Araali's own indomitable spirit, Araali not only survived -- shrugging off the inevitable setbacks that come with being an orphan -- he's gone from strength to strength! Now a young adolescent, aged 8, Araali has an independent and dogged temperament. Like Moses before him, Araali can be a disruptive presence in the group, having recently begun challenging the adult females. However, alpha male Sylvester has taken Araali under his wing, and is particularly tolerant of him even when Araali mates with 'forbidden' females. Perhaps Sylvester recognises Araali might be a valuable ally in a few years time! 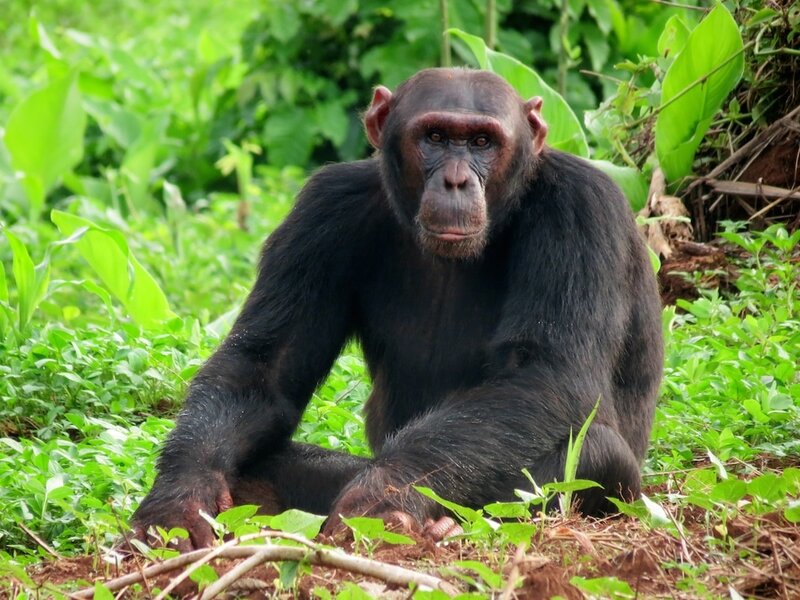 ​10-year old Jenny is the daughter of the late Joyce, Bulindi's once-oldest chimp, from whom she inherited her long, gangly frame. Since reaching adolescence, Jenny's caused quite a stir among the Bulindi males. She frequently exhibits a large pink swelling of her perineal skin which the males find irresistible. Since most of the adult females are nursing young infants, Jenny reluctantly finds herself the exclusive recipient of the males' interest, and she's often the unwitting cause of boisterous social excitement in the group. Things will calm down for poor Jenny once she becomes pregnant in the next year or so. LEILA is a tough cookie. 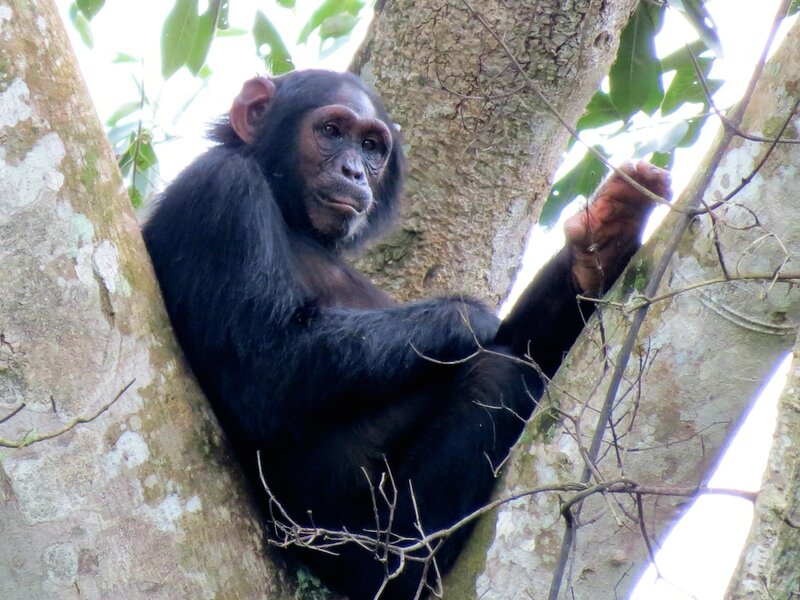 At 17 or 18, she's still young but she's the top-ranked female at Bulindi -- which is unusual, since in chimp society a female's rank is usually related to her age. We strongly suspect Leila is the daughter of the elderly Joyce (they always hang out and share food together), and Joyce seems to have been the previous alpha female. Perhaps, then, Leila has enjoyed a privileged position since she was young. 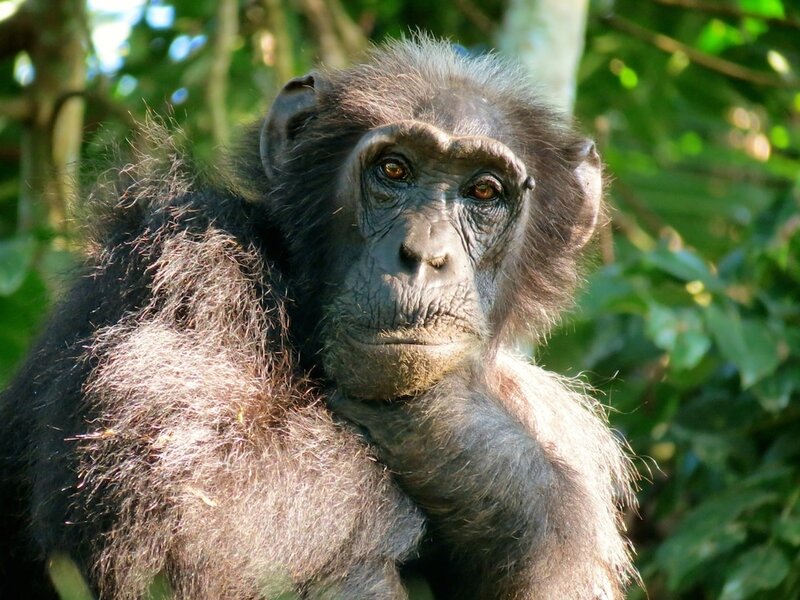 Leila is Bulindi's noisiest chimp; her distinct raspy voice carries for miles. She often calls and displays for no apparent reason when the others are resting. She has 2 offspring: 4-year old Georgia and 11-month old Wendy. Leila's girls typically ride together on her back during travel. Four year-old Georgia is Leila's eldest offspring. As the daughter of the top-ranked female in Bulindi, Georgia benefits from her mother's influential role at the centre of the group. Not surprisingly she's confident for her age, and she's bigger than her close age-mates Merrick and Rohen. While some infants struggle when their mother gives birth to a new baby, Georgia seemed delighted when baby sister Wendy came along last year. She relishes her role as big sister and can often be seen carrying Wendy on her back or belly, just as Leila does. Clearly, Georgia will be an excellent mother one day! 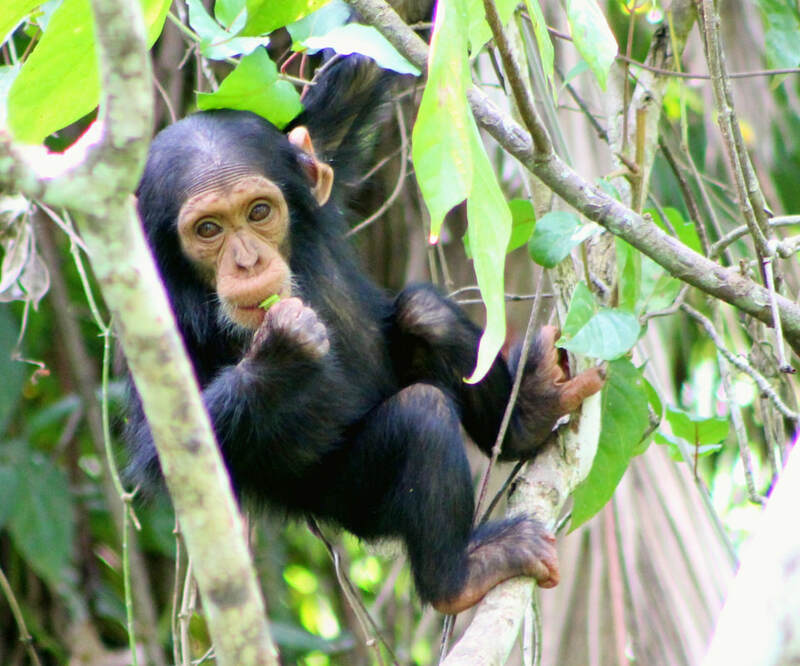 Wendy is Leila's infant daughter and the youngest member of the Bulindi chimp community. She's now 11 months old! Wendy was recently named after Wendy Tisdell, director of BridgIt Water Foundation who generously supported a borehole project at Bulindi. Thanks to the help from (human!) Wendy, 3 villages in Bulindi now have access to clean water -- impacting over 1000 people! 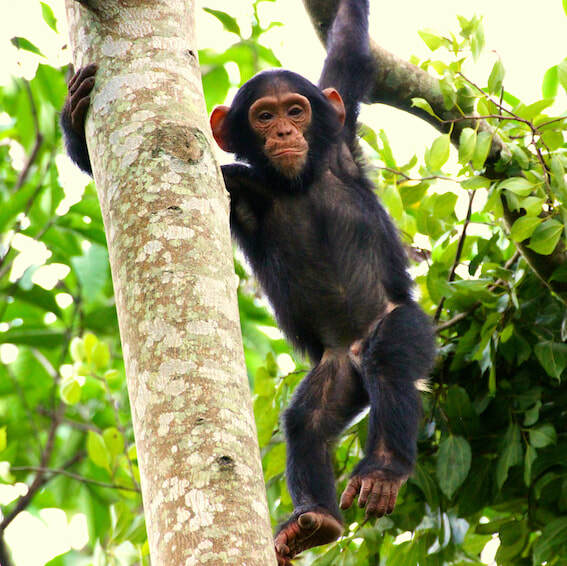 Already we're seeing a positive effect for the chimps too: the boreholes mean that people no longer fetch water from the forest, and as a result they're less likely to get into altercations with the chimps! Maureen is a senior member of the Bulindi community. We can't be sure of her age, but she's probably nearing 40. She's witnessed huge changes in her lifetime: the destruction of her forest home and the shift to a life foraging in village gardens and trying to avoid people. 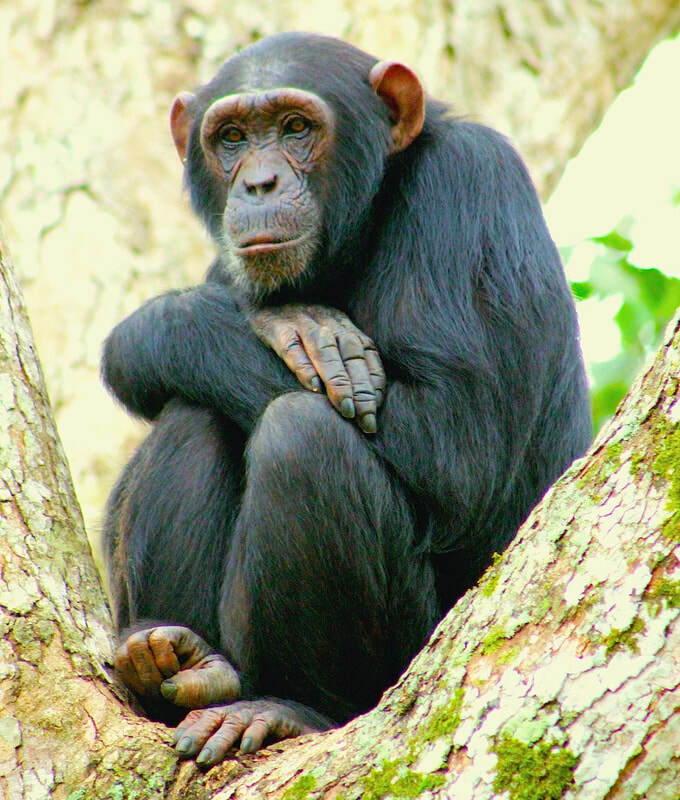 Maureen has an air of detachment about her and is one of those chimps who seem 'hard to know'. 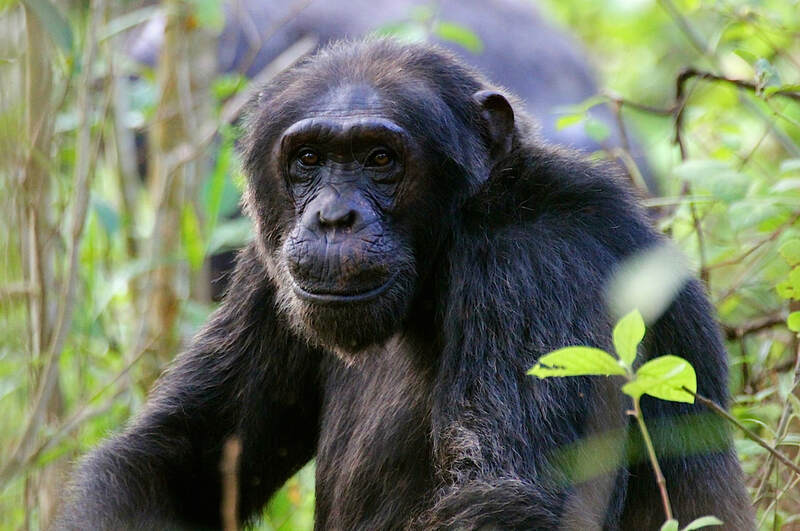 While she prefers to stay quietly in the background most of the time, she's a tough old chimp and, if riled, even noisy females like Leila won't dare take her on! Maureen's mothering style sometimes verges on 'tough love' but she produces calm, self-assured and independent offspring. Her known children are Tom (sadly deceased), Jack, Rohen and her latest infant, Lucia. 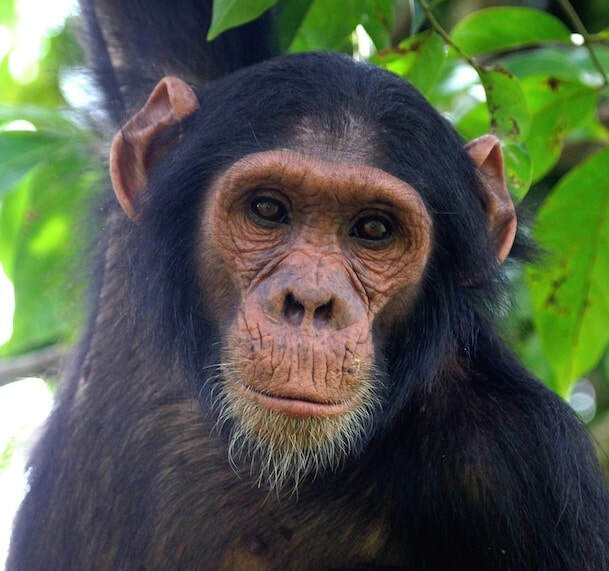 Maureen was named after chimp researcher Maureen McCarthy who conducted the first genetic census of Hoima's 300 'village' chimpanzees, including the Bulindi community! Jack is the elder of Maureen's two boys. 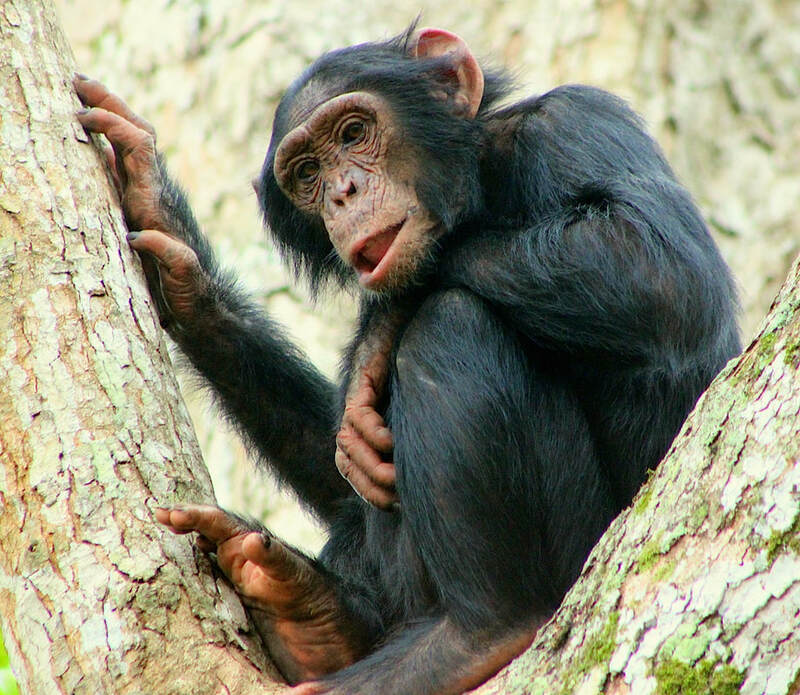 Aged 9, he's now in the early throes of chimp adolescence - a time when young males push boundaries and generally annoy their elders (much as human teenagers do!). 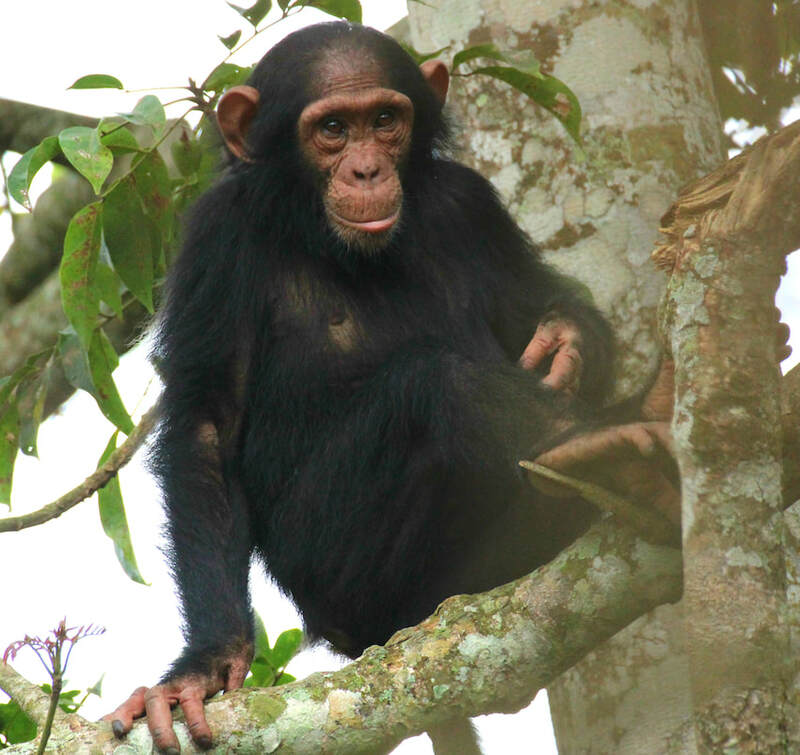 But Jack's exceptionally laid-back, a very cool chimp. It often seems he's as interested in his human observers as we are in him: he likes to approach to study us, all the better if done from the comfort of a nest made at head-height. We expect Jack to develop much like his older brother Tom who earned the respect of his peers through calm leadership skills, rather than bluster. Sadly Tom died in 2015 after being injured by a steel trap. If Jack can survive in the dangerous human world at Bulindi, we expect him to increasingly exert his calm and astute influence on the group in the coming years. Rohen is Maureen's youngest son. Although not yet four, he's quite an independent chap already. 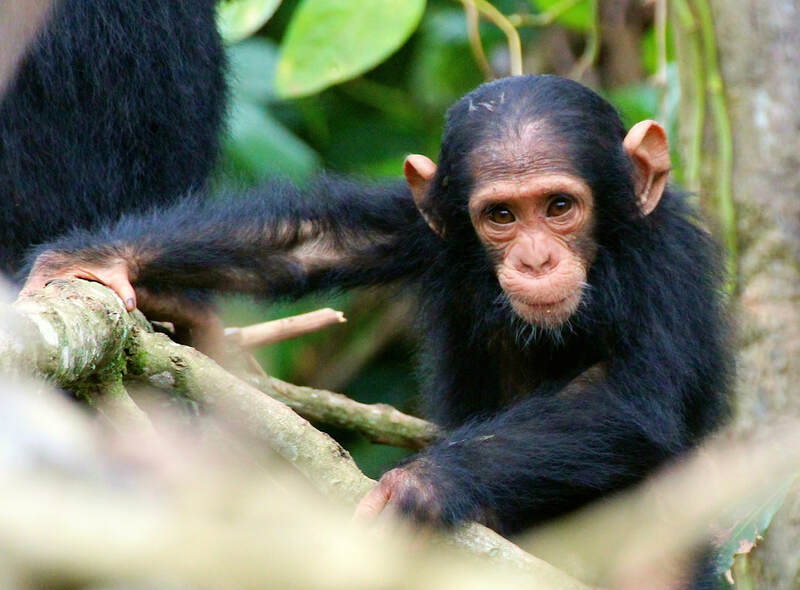 Rohen's little sister Lucia came along when he was only two and a half, which is very young for an infant chimp to be relegated to second priority by mum. But Rohen didn't seem too troubled by the experience and enjoys romping around with Lucia. Rohen is the proud owner of the largest pair of ears in Bulindi. 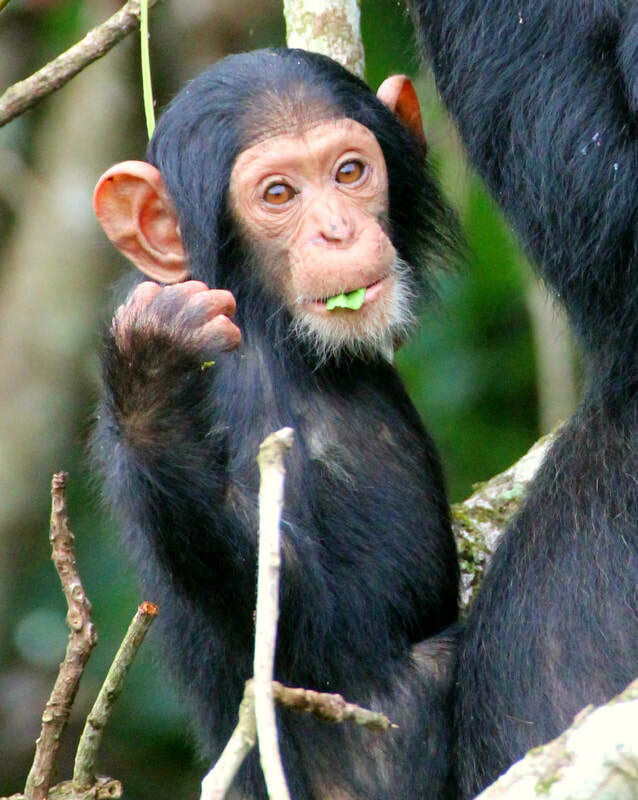 16-month old Lucia is Maureen's youngest offspring. 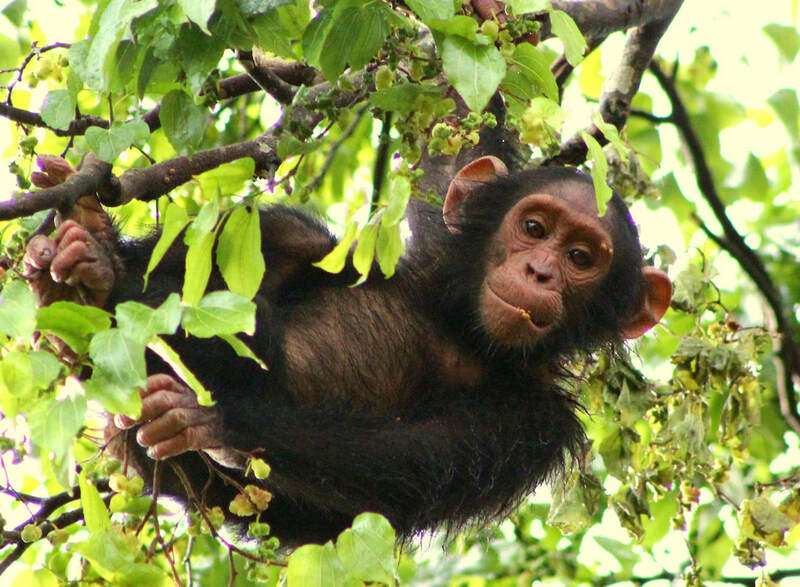 She was one of a trio of infants born during Bulindi's baby boom in April 2016. 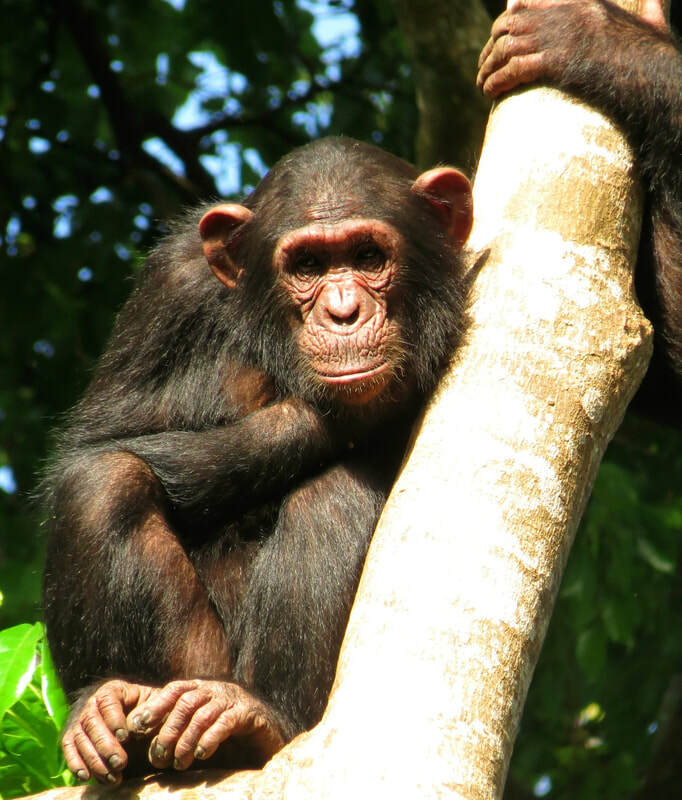 Recently, we've begun seeing more of Lucia since she's started clambering around independently of Maureen, playing with older brother Rohen, and shaking small branches at us! Teddy's a large, nervy adult female in her late thirties. 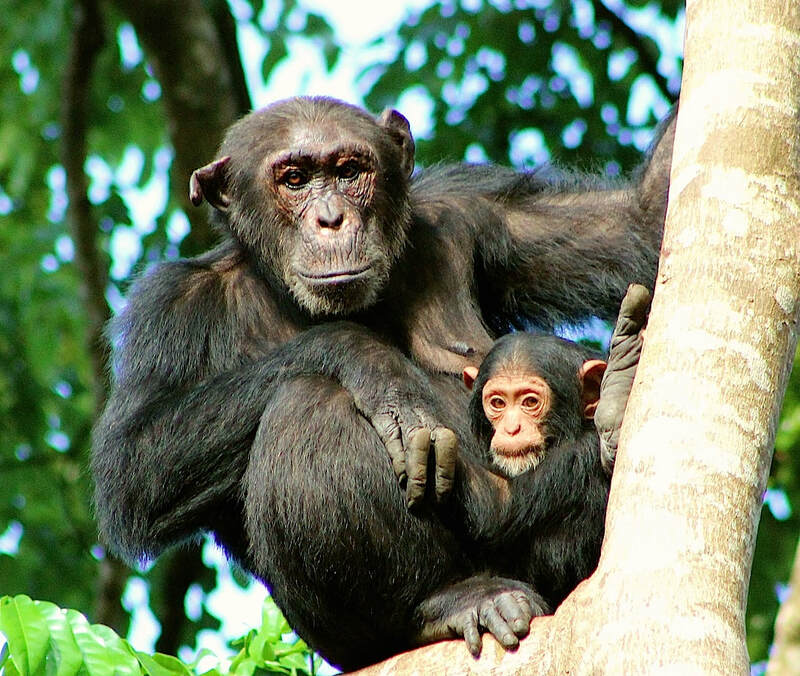 She's the least social of all the Bulindi chimps and may choose to range alone with her offspring for days or even weeks at a time. 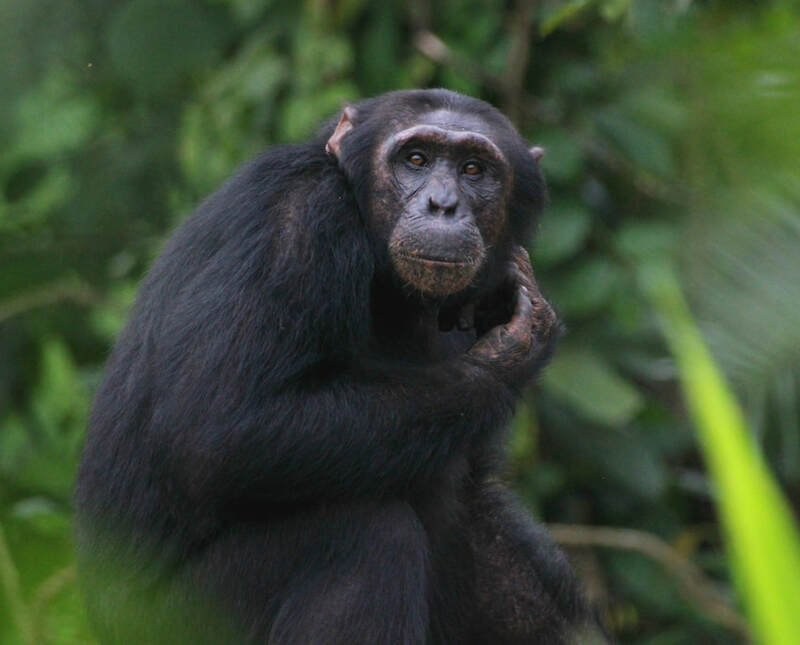 She's also the shyest chimp in our presence, preferring to stay out of sight unless she's in the company of the big males. When we first got to know her in 2012 she wasn't especially skittish, but her confidence seemed to wane following the disappearance of daughter Tammie in 2013. Teddy is always accompanied by her 7-year old daughter Tabitha and 3-year old son Ally. Tabitha is Teddy's juvenile daughter. All her age-mates are males (Jack, Araali and Gerald) and perhaps as a result she's quite tomboyish and has a feisty streak. Unlike her mum Teddy, Tabitha isn't shy of us and may approach to shake branches or throw small sticks at us. Now aged 8, she's beginning to develop small pink swellings of her perineal skin, indicating she's entering adolescence. We expect the males in the group will start taking more notice of Tabitha next year! ALLY is Teddy's youngest infant. We didn't see much of him until quite recently, given Teddy's shy and protective nature. Sometimes when Ally's wobbly infant wanderings took him too close to us, a black hairy hand would shoot out from the undergrowth to pull him back safely out of sight. Aged three, he's now reached the age where Teddy doesn't feel the need to keep such a close eye on him. A curious chap, Ally clearly loves his new-found independence! 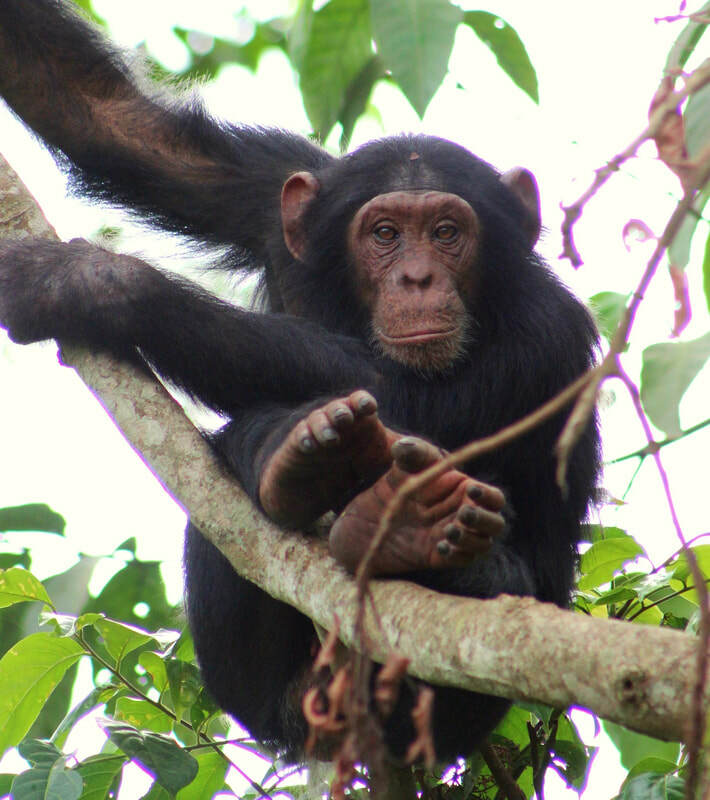 MIRINDA is about as nice a chimpanzee as you could hope to meet. She's in her mid-twenties and solidly built, but she isn't high-ranking. 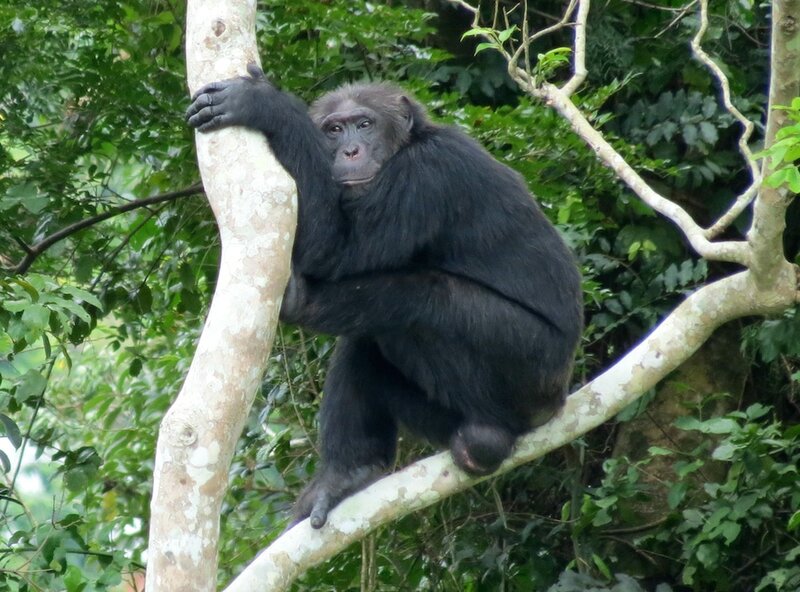 She's very social and good-natured, and popular with the other chimps and human observers alike. She's the queen of grooming, always happy to groom other chimps even if they don't always groom her in return. 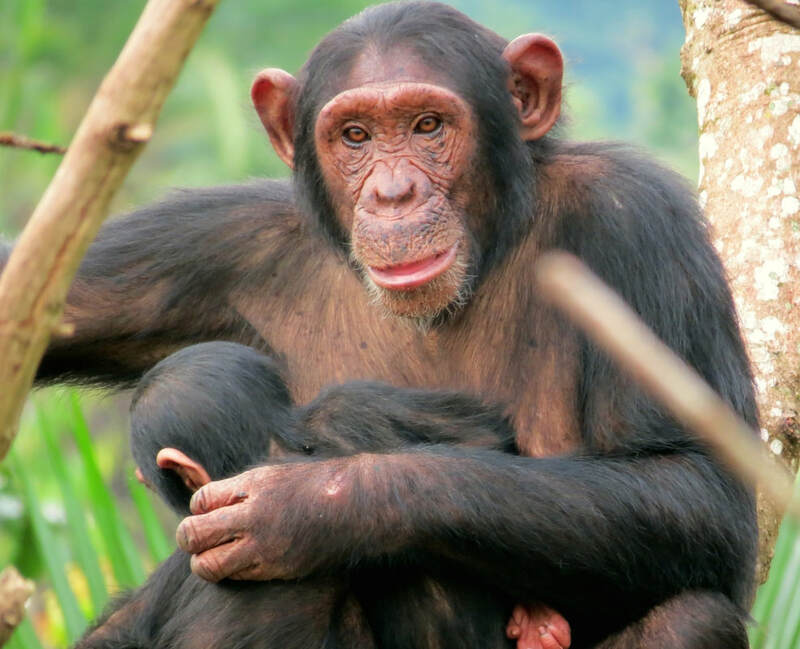 A mother of four (Jemima, Gerald, Merrick and Maria), and grandmother of one (Kasatu), Mirinda has passed on her even, friendly temperament to all of her offspring. Her close-knit family form a calm and stable core of Bulindi society. Mirinda is easily recognised by her round brown face and floppy right ear. Jemima (pronounced Yemima), the youngest mum in the Bulindi community. We first got to know her as a juvenile in 2012. 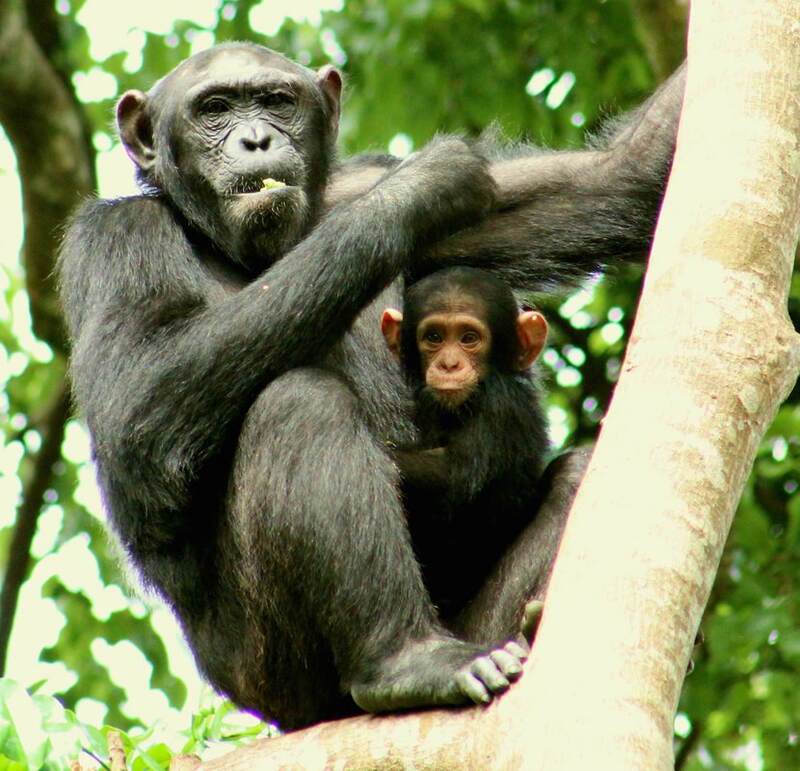 In the wild, female chimps normally give birth for the first time aged 13-16 years old. So it came as a surprise when Jemima gave birth to infant Kasatu last year when she only 10 or perhaps 11. She was still growing herself and owing to the energetic demands of motherhood, Jemima has remained small as an adult. Unfortunately little Kasatu passed away before he reached his second birthday. 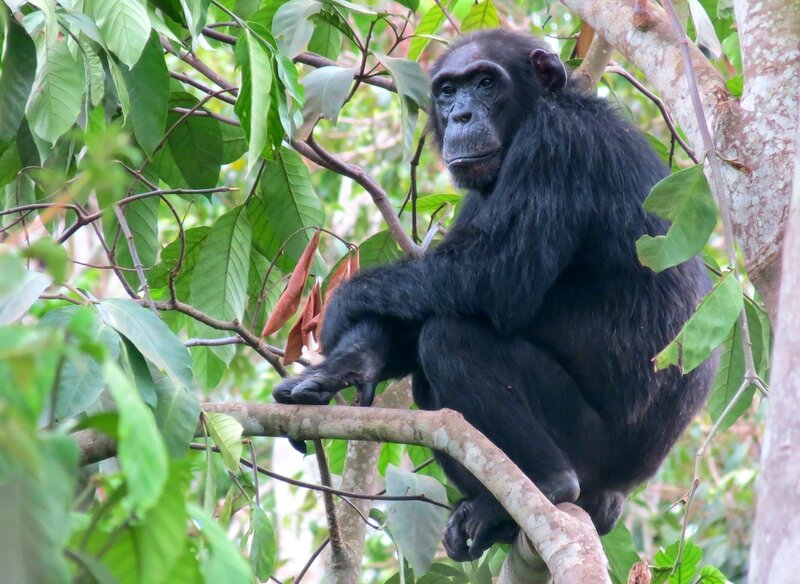 8 year-old GERALD is one of three young males at Bulindi entering adolescence. 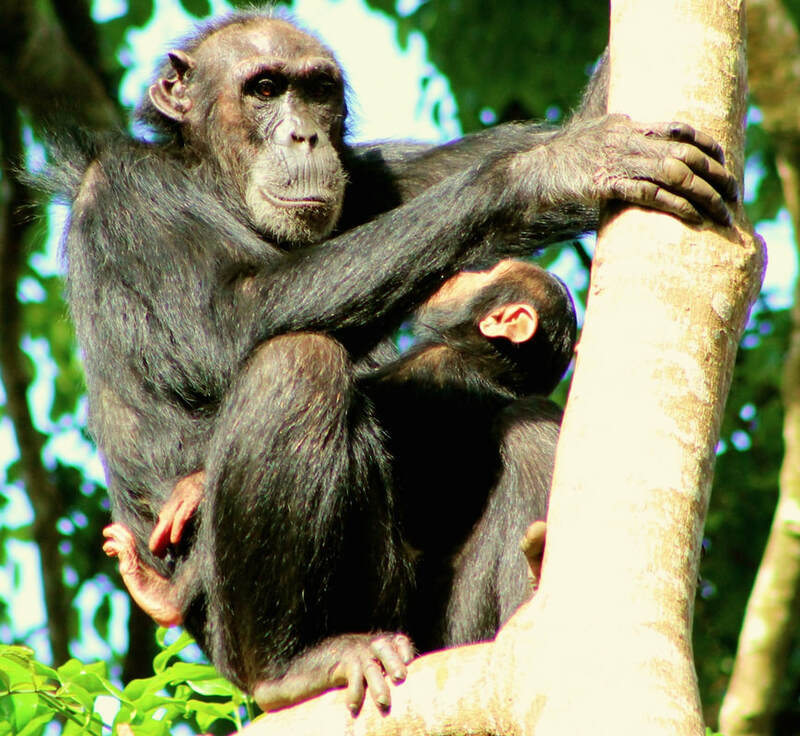 Unlike his more adventurous age-mates Jack and Araali, Gerald has been slow to embrace independence and was, until recently, rather a mummy's boy. 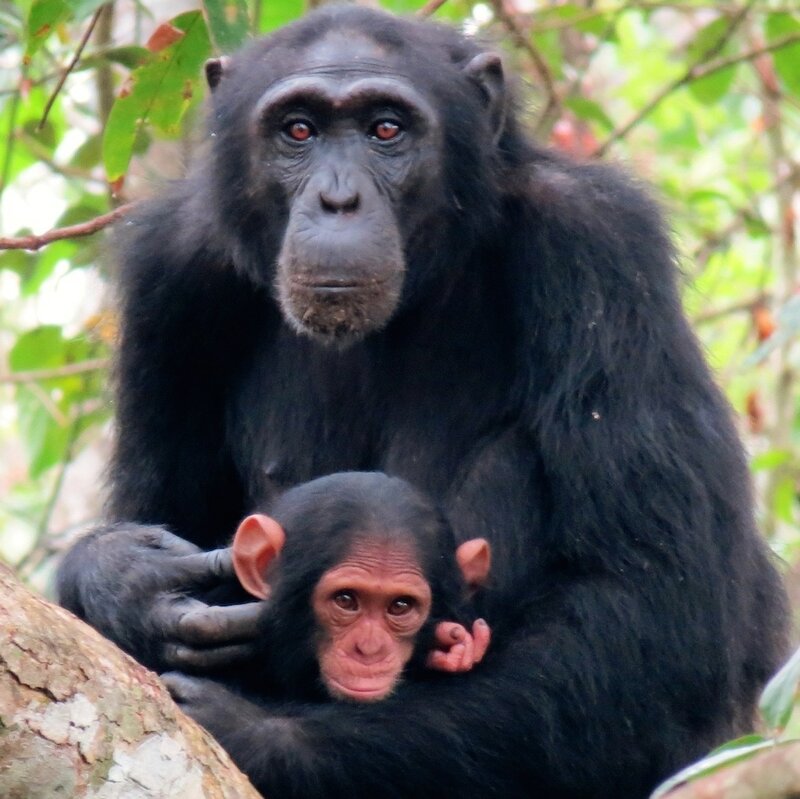 This is perhaps because his mum Mirinda is an affectionate female who keeps her older offspring close, even though she has younger infants to care for. This year, however, Gerald has begun seeking the company of older males and spending time apart from Mirinda. Gerald has inherited Mirinda's calm personality, and we expect him to grow up to become a well-rounded and likeable young male. Mirinda's youngest son, and younger brother to Gerald, MERRICK is soon to turn 4 years old. Merrick was named in honour of Nancy Merrick, one of the Bulindi project's greatest supporters. He's quite small for his age, probably because Mirinda had her latest infant (Maria) when Merrick was only 2 and a half. 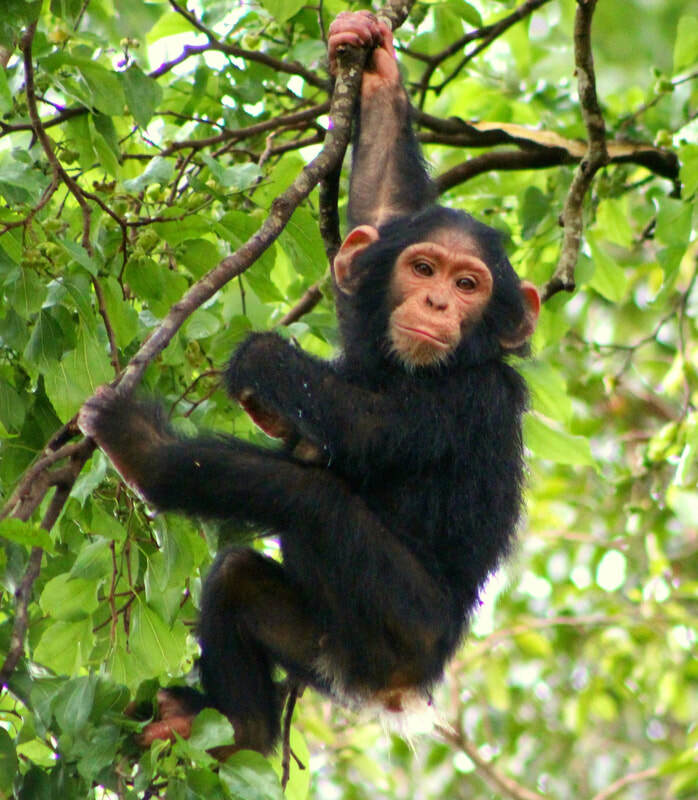 Merrick's a curious young chimp and likes to swing around on vines in front of his human observers, back and forth, back and forth. His other idiosyncrasy is his habit of 'blowing raspberries' repeatedly through his lips. Consequently, we can often hear Merrick before we actually see him! Little MARIA is Mirinda's youngest offspring. She's one of three infants born at Bulindi in April last year. Now aged 16 months, she's starting to become ever-more curious about the world around her.